Elaine Gottschall said that " Bacterial and yeast infections go hand in hand. As the SCD decreases the number of both or either one, you will improve." Kendall Conrad¹s introduction to the life-changing Specific Carbohydrate Diet came when her daughter developed severe digestive disruptions as a toddler. Conrad¹s daughter was not only in pain, but she was having great difficulty absorbing nutrients from foods and was failing to thrive. Luckily, Conrad found a nutritionist who turned her onto biochemist Elaine Gottschall¹s revolutionary diet, outlined in the bestselling book Breaking the Vicious Cycle, which has been published in seven languages and has sold more than one million copies worldwide. The eating plan is unique in that it has helped sufferers of numerous digestive conditions, from ulcerative colitis and Crohn¹s disease to celiac disease and irritable bowel syndrome. In fact, seventy-five percent of patients diagnosed with these disorders reported immediate improvement when they tried the SCD. Parents of autistic children have found it useful in managing the digestive issues that often accompany autism. And it helped Conrad¹s daughter, who has grown into a happy and healthy young girl. Now, for the first time, is a comprehensive cookbook full of delicious, no-deprivation fare that the whole family will truly enjoy. The 150 tempting recipes include Thai Beef Salad with Papaya and Toasted Coconut, Roast Chicken with Blood Orange and Paprika, Shellfish Paella with Zucchini and Homemade Chorizo. While EAT WELL, FEEL WELL covers the basics of the diet and how and why it works (basically you have to eliminate complex carbohydrates, but simple natural sugars such as those from fruits and honey are just fine), the focus is on the fantastic food. There is a chapter on Mock Starches for when cravings hit. There is even a section Just for Kids that helps parents make SCD-legal treats so their kids won¹t feel left out or different from their peers. 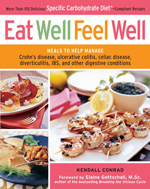 Featuring a lovely 16-page photograph insert‹that shows just how enticing this food is‹and a foreword by SCD founder Elaine Gottschall, EAT WELL, FEEL WELL will be eagerly embraced by the millions of Americans who live with agonizing digestive conditions and will have them back at the table, enjoying dinner with friends and loved ones, for the first time in years.